I was told I would receive a promotion/discount. Where is this on my bill? If you are receiving a promotion or discount, this will be shown in the section called "Savings and Discounts" on your bill, and also in the summary section on the first page. The details in the "Savings and Discounts" section will show you the description of your discount or promotion, the dates to which this applies to and the amount you saved. 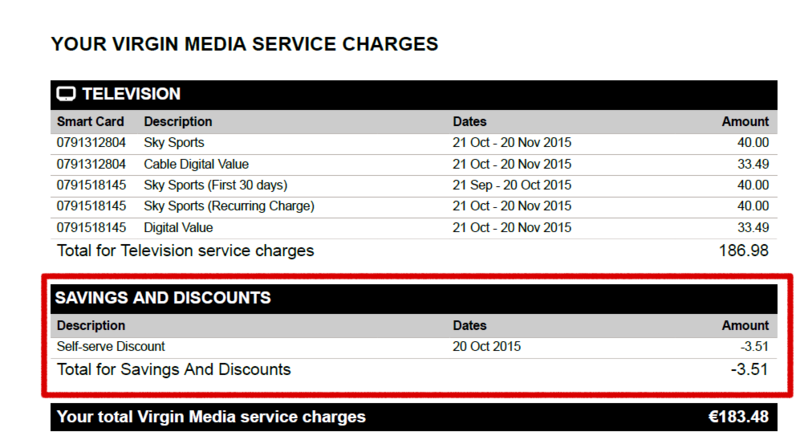 Note: Your Total Virgin Media service charges are the Total Virgin Media Bundle Charges minus the Total for Savings and Discount of that bill period.